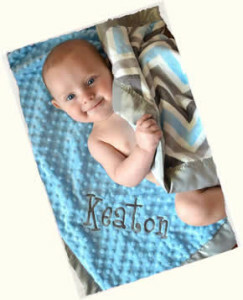 Personalized Minky Baby Blanket | Monogram Yours Today! Are you looking for a personalized Minky baby blanket for a new mom-to-be? If so, The Minky Moon is here to make you a one-of-a-kind personalized Minky baby blanket for just the occasion. The great thing about a personalized Minky baby blanket is that because they are completely customized baby blankets, you can order them to match any theme. Blue theme, check. Pink theme, check. Jungle theme, check. Minky baby blankets are also the softest, snuggliest baby blankets money can buy. One of the best parts about the process is that you can see a preview of your personalized Minky baby blanket throughout each step, and you can easily go back and edit any step at any time. This feature allows you to play around with different colors and designs until you get your personalized Minky baby blanket just the way you want it. In addition to comfort, Minky baby blankets have other benefits as well. They are extremely easy to care for and are fade and stain resistant. No more worrying about how many times you’ve already had to wash the brand new baby blanket or those baby food carrots that got streaked across it as it was being used as a napkin. Your personalized Minky baby blanket will survive! This entry was posted in Personalized Baby Blankets on April 24, 2015.